Ballast test systems based on the XiTRON 257xR Series Ballast Analyzers are now in use by most of the world’s major electronic ballast manufacturers. These test systems have been adopted by these manufacturers because of their greatly enhanced capabilities and reduced maintenance over previous systems. The 257xR Series Ballast Analyzers are the most accurate, fastest and ideal system for ballast and tube testing and are very simple to configure because they have been specifically designed for ballast testing. This considerably reduces any delays and costs in introducing new ballast test systems or implementing an increase in production volume. The 2571R, 2572R and 2573R models are similar to the 2574R, but with measurement capability for tube A (2571R), tubes A and B (2572R), tubes A, B, and C (2573R). Whereas, the 2574R has measurement capabilities for A, B, C and D. Line measurements are available for all four inputs in all models. The 257xR Series are high performance test equipment for testing ballasts and tubes. Within the analyzers, voltage and current signals are converted to digital data using DSP chips where the signals are sampled automatically and periodically as the A to D converters scale and sample data. The 257xR Series analyze both the electrical power being delivered to and returned from single-tube ballasts, multi-tube ballasts and multiple single- and multi-tube ballasts. With the 2574R, up to four tubes and four ballasts can be tested in a fraction of a second for every key parameter, including peak inrush, striking and light efficiency (when used with a light monitor). With a capacity of 2,000 measurements per second on each of up to 30 signals, the only limitation to testing throughput is the speed of your production line. The analysis can be performed one at a time or in automatic succession. The rear panel provides the needed connections required for a wide variety of ballast testing and systems interfacing. 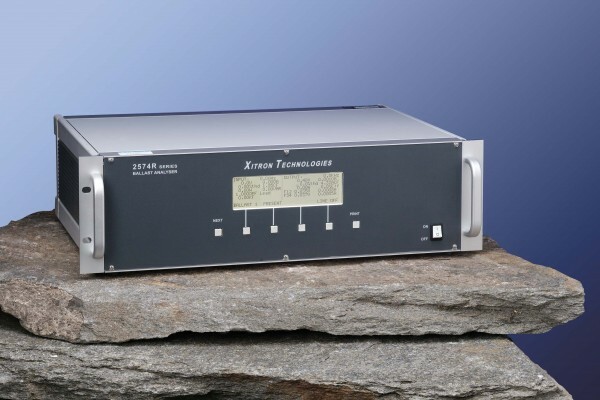 The 2574R can be used in standalone or computer controlled environments. It allows the user to simultaneously measure all pins on all tubes, independent output measurements, 12 voltages and 12 currents (i.e. independent tube V and I measurement, independent filament V and I, for each tube that is configured). Continuous sampling at up to 2MS/s ensures that even the shortest transient events are measured. The 2574R displays results in numeric and graphic waveform formats. Results include voltage, current and power, harmonics and plots of measured results versus time. Various versatile interfaces including GPIB and General Printer Interfaces and the XiTRON XView Utility Software are provided as standard accessories.